RADIO DAZE – AN ARCHIVE EDITION – HIP 003 some missing gems. 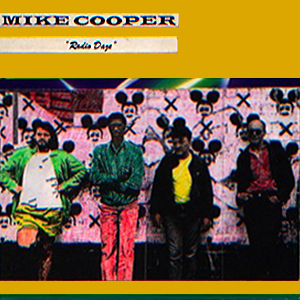 MIKE COOPER with TRYSTERO SYSTEM, BEATING TIME and MAYHEM QUARTET – 1984-86. During the eighties in the bad old days of Thatchers reign of terror when I was still living in Reading in the UK. sax player Tim Hill and I formed three groups. TRYSTERO SYSTEM was a duo dedicated to welding wild improvised sounds across the top of beats – common stuff now but this was pre-sampler days. Trystero System has had many incarnations over the years – including one with Pat Thomas – but this was the first and so far the only one to be recorded. The name came from Thomas Pynchon’s novel The Crying Of Lot 49. Udo Breger – one time secretary to William Boroughs – once wrote my Trystero System into a catalogue for an art exhibition as a piece of fiction – thus completing the circle – and it still lives – there was a recent outing in Roma at La Palma with Fabrizio Spera on drums and more recent version (2009) with VJ Grayson Cooke in Wellington New Zealand and in Bundaberg in Queensland Australia. BEATING TIME – A funk / punk jazz outfit with Ornette/Arthur Blyth yearnings with Paul Burwell playing drums and Garry Jones playing bass. Both Paul and Garry passed away in the same year – 2007. They are missed. Here they are both featured heavily playing to one of my hand crafted super eight films – unfortunately I made it just after Paul died and just before Garry – so the dedication only reads to Paul…but its for both of them. MAYHEM QUARTET with Pat Thomas – electronics and keyboard wizard plus Neil Palmer who we seem to think was Europes first records / turntables improviser – pre figured trip-hop / jungle and many other electro machine styles now common place. Plus a special dub groove with sax genius Lol Coxhill.